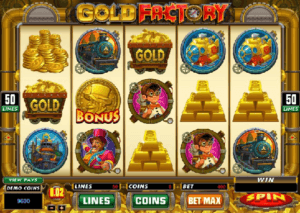 Dolphin Coast is similar to many other video slot games coming out today in that it features state of the art graphics, an eye-catching theme and relaxing music. 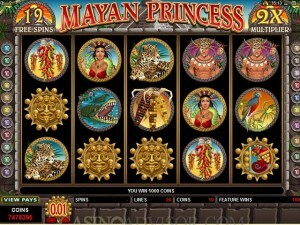 This Microgaming slot can be played at casinos such as Crazy Vegas Casino, Platinum Play Casino and others. 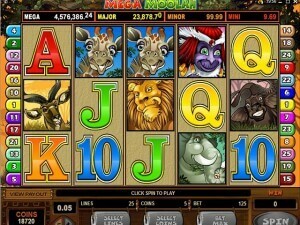 Dolphin Coast expands on the 243 Ways to Win system, instead offering 3,125 of them! 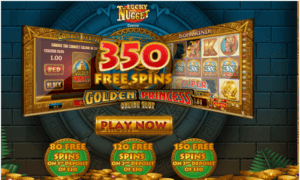 This system does keep the player engaged through small, incremental victories, while the pull of the possible large wins this game can offer will keep you coming back. 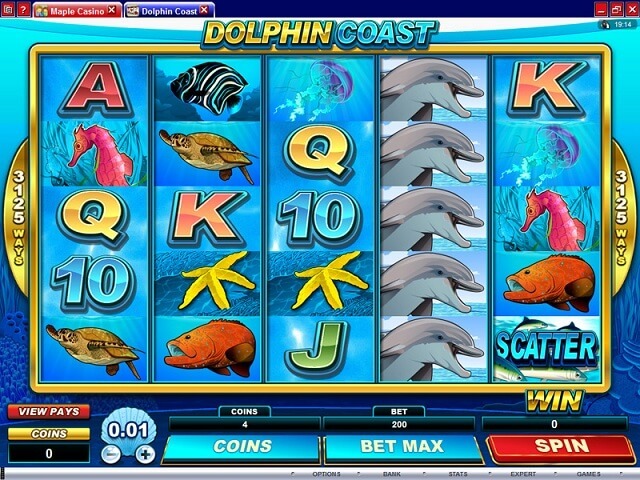 Dolphin Coast is a video slot that is themed around ocean wildlife, with various fish (including the dolphin himself, of course), starfish, and 10, J, Q, K and A symbols. 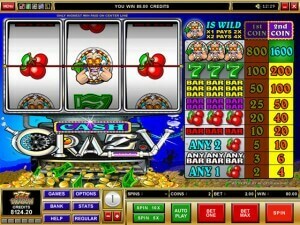 Because of the rather unorthodox betting format of this game, the coin values can only be set at 1 cent and 2 cents. 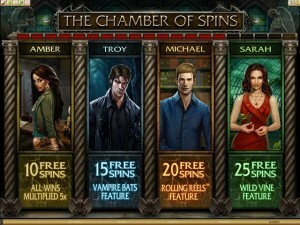 However, you can bet up to 500 coins for a maximum bet of $10.00 on each spin. 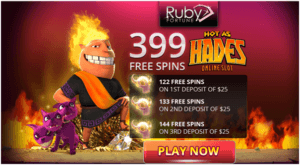 The highest jackpot is where this game really shines. You can win up to 800,000 coins while playing Dolphin Coast. 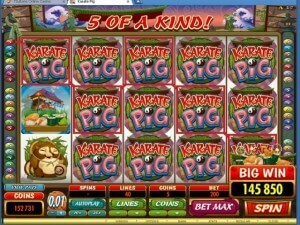 It’s not easy to win the 800,000 coin jackpot, of course. You’ll need two reels of wilds and turtle symbols, followed by selecting from three dolphins, which will give you either a 2x, 3x or 4x multiplier. 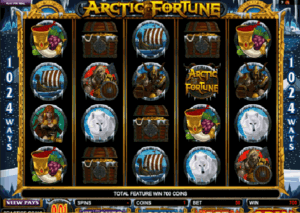 The Dolphin Coast wild symbol will substitute for other symbols (besides the scatter) and can take you to the afore-mentioned mode where you pick between three dolphins to multiply your winnings. 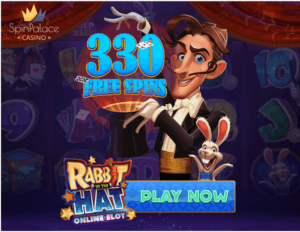 Meanwhile, the scatter symbol can give you up to 25 free spins when you get 3 through 5 of them on one spin, and free spins can be re-triggered. 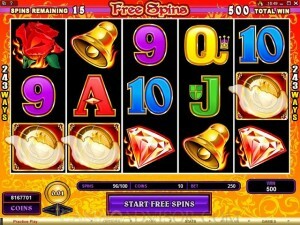 Dolphin Coast has a lot to offer, with staggering numbers of wins happening on a single spin through the thousands of ways to win the game offers. 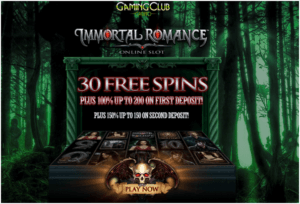 There’s even a gamble bonus game to double your winnings, if you’re feeling lucky. Dolphin Coast is the epitome of a full-featured video slot, and players from Canada and around the world will surely enjoy giving it a try. Copyright (c) 1998-2019 Free Slots Canada., All Rights Reserved. Content may not be duplicated.